The State of Connecticut recently had the court release an unredacted version of their previously filed charges against LCI, MYL and others. The charges filed allege that current LCI employees were colluding with PAR (while the current Chairman of the BOD was in the same role at PAR). The range of potential fines is large ($194m-$300m) but even the low end of that range would call into question the firm's ability to remain solvent. The investigation into generic drug price fixing has been picking up steam, the equity analysts refuse to recognize the potential fines in their models. According to this article in the Hartford Courant: 16 companies and 300 drugs are under investigation for what assistant attorney general and antitrust investigator Joseph Nielsen describes, "This is most likely the largest cartel in the history of the United States." Although GAAP accounting standards don't require the company itself to record a contingency for the potential fines - the sell side really should have attempted this analysis by now. 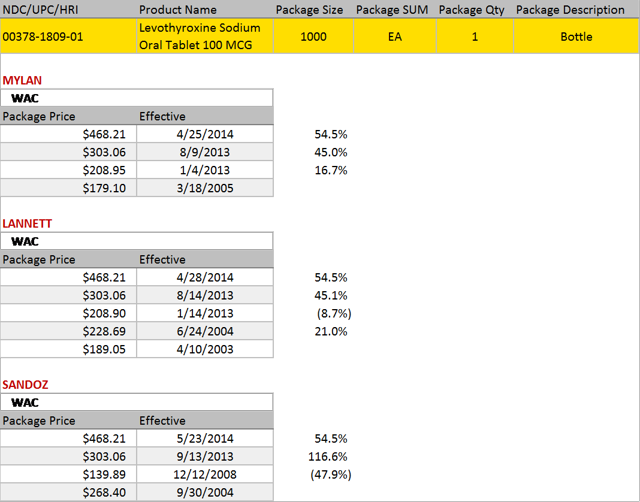 Below I present a simple analysis that yields a fine between $194 million and $300 million for LCI on Levothyroxine and Digoxin alone. All $ numbers in this report are in millions. Below you can see that the methodology used is very simple and straight forward. 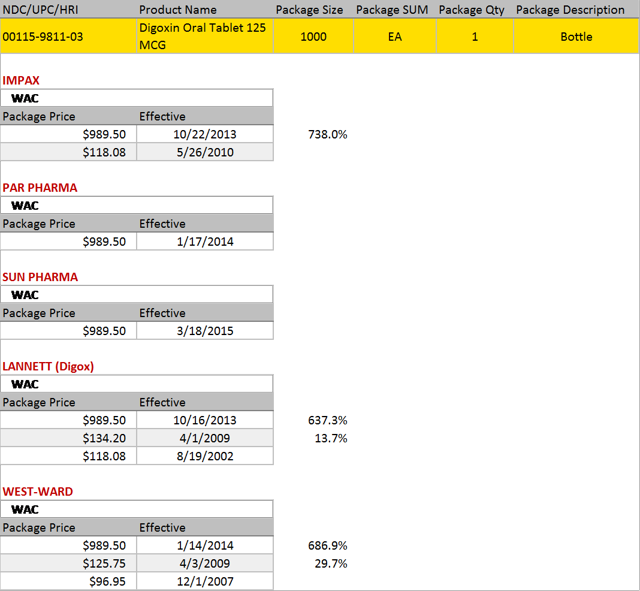 I simply take the sales figures from before the price increases and apply a reasonable growth rate to them (5% annual price raises in this case, which is generous considering medical CPI trends at about half that rate) to establish a "baseline" by which to asses the "damages" created by price gouging. The damages are quiet simply the delta between our baseline and actual sales. For the purpose of establishing what the fine would be I am leaning on a white paper (LINK), which establishes that the median settlement for recovery of overcharges is roughly 37% of the established overcharged amount. 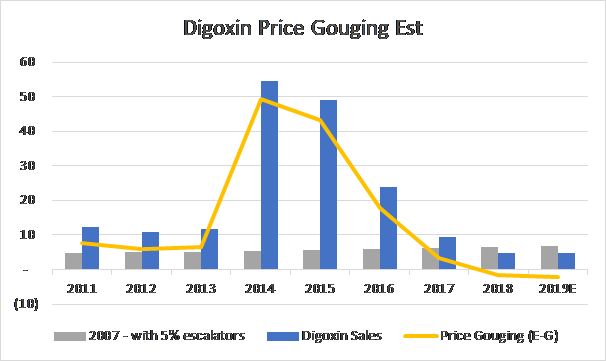 As you can see the effect of the alleged cartel pricing was material to LCI's sales for Digoxin. 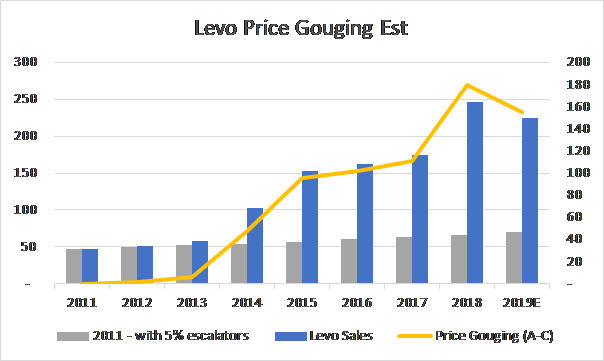 The levothyroxine pricing paradigm is ongoing and has been an important source of revenue for the company over the past 5 years, I expect that this drug will be included in any global settlement. 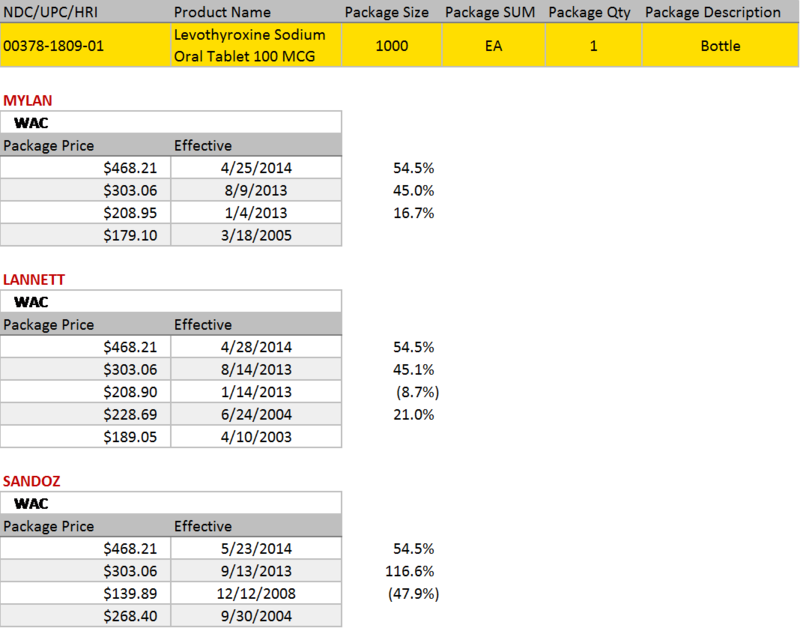 I lack subpoena power so I have to lean on publicly available pricing data, for levothyroxine the 54.5% hike initiated by MYL in 2014 looks incredibly suspect. One has to ask the question, "how is it that no one tried to take market share after MYL raised price by 54%". Instead all the major players raised price to match the MYL increase, that behavior can effectively keep market share stable while increasing everyone's profits. If the parties are communicating with each other to coordinate such activity then the authorities may consider them to be behaving as a cartel and charge them with price gouging. That is exactly what the State of Connecticut is doing here. 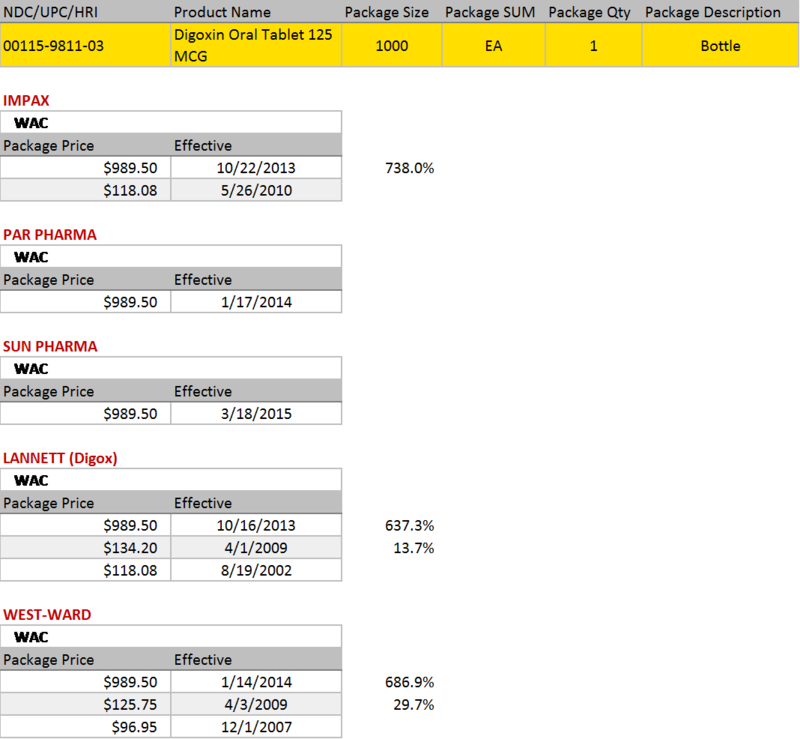 Digoxin has a similar pattern, but this time LCI led the price increase with a whopping 637% increase in 2013. Spoiler, everyone followed and when Sun launched in 2015 they launched at the established price. The consumer reaped no rewards from the competition as price stayed high even when additional market entrants were introduced. The current investigation into 300 drugs broke open when the executives at Heritage Pharma turned states evidence. Heritage was involved in some but not all of the 300 drugs that the State of Connecticut is investigating - however the cooperating witnesses have given us a chance to read about how this alleged scam was perpetrated. And the testimony directly implicated LCI. In a newly released "unredacted" version of the charges, the State of Connecticut confirmed communications between LCI and Heritage comprised 113 out of the 513 text messages/calls on price fixing entered into evidence (22% of the evidence). 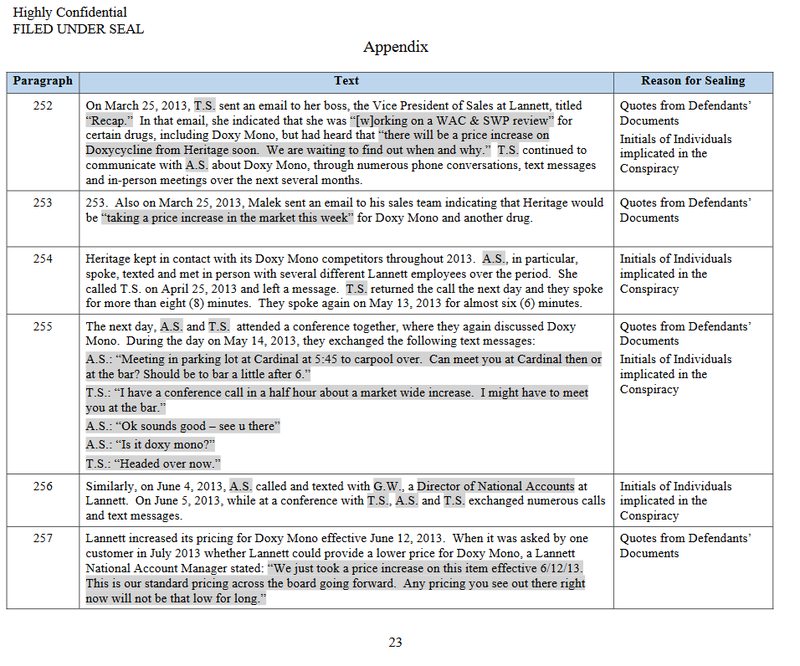 Previously redacted were the actual text messages, but on page 23 of the appendix (LINK) found below. The State alleges a person with the initials "T.S., the Director of National Accounts at Lannett" conspiring with Heritage and eventually PAR & MYL to raise the price of Doxycycline. According to the charges in this case LCI and many other generic pharmaceutical firms have been conspiring for years to drive prices of generics up. LCI - for its part - has failed to display even the slightest bit of contrition given that the new Chairman of the Board (Patrick LaPore) was the chairman at PAR pharma when the two companies were allegedly colluding together. I don't think we should assume much has changed at LCI. In the end there is no clear path for LCI to remain solvent if they receive a fine roughly equivalent to their market cap (high end of the proposed range). In a previous report I highlighted how little free cash flow was projected given the current guidance. With a run rate of ~$107m in EBITDA, $68m in interest expense and $32.5m in CapEx (mid-range of the guidance) the company will be producing ~$7m in FCF. $7m in FCF isn't going to be very helpful in paying off the $650m in net debt, but in a situation where the government tacks on a few hundred million of additional liabilities - that probably spells bankruptcy protection. Disclosure: I am/we are short LCI. I wrote this article myself, and it expresses my own opinions. I am not receiving compensation for it (other than from Seeking Alpha). I have no business relationship with any company whose stock is mentioned in this article. Additional disclosure: I am/we are short LCI. All information for this article was derived from publicly available information. Investors are encouraged to conduct their own due diligence into these factors. Additional disclosure: This article represents the opinion of the author as of the date of this article. The information set forth in this article does not constitute a recommendation to buy or sell any security. This article contains certain "forward-looking statements," which may be identified by the use of such words as "believe," "expect," "anticipate," "should," "planned," "estimated," "potential," "outlook," "forecast," "plan" and other similar terms. All are subject to various factors, any or all of which could cause actual events to differ materially from projected events. This article is based upon information reasonably available to the author and obtained from sources the author believes to be reliable; however, such information and sources cannot be guaranteed as to their accuracy or completeness. The author makes no representation as to the accuracy or completeness of the information set forth in this article and undertakes no duty to update its contents. The author may also cover his/her short position at any point in time without providing notice. The author encourages all readers to do their own due diligence.